The External Scientific Advisory Board (ESAB) is an independent body carrying representation from international senior academics, clinicians and patient representative groups. 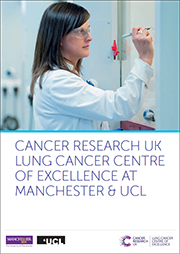 Meeting annually, the Board is tasked with advising the CRUK Lung Cancer Centre of Excellence leads on the scientific strategy of the Centre and its implementation. The Centre Management Group is charged with leading the development and delivery of the agreed research strategy for the CRUK Lung Cancer Centre of Excellence at Manchester and UCL, as well as overseeing the governance, resource and financial arrangements of the Centre. The Group manages the Centre on a day to day basis, as well as coordinating and regularly reviewing the progress and success of the Centre’s research themes. The Research Programme Management Committee is responsible for developing and implementing the programme of work undertaken at the CRUK Lung Cancer Centre of Excellence and overseeing the Centre’s training programme. The committee actively manages the research themes, facilitating ongoing and coherent integration of projects to add value, as well as providing an internal peer review process for the Centre’s grant applications. The committee also oversees and identifies areas of potential collaboration both within and outside the Centre.